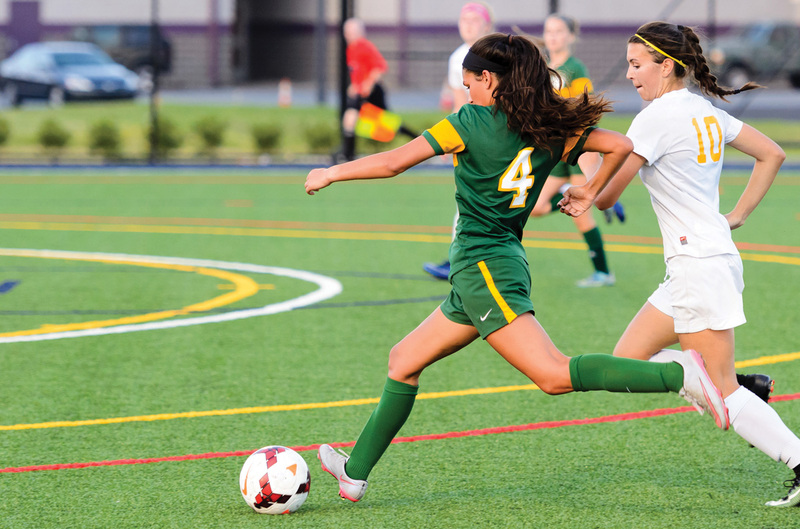 IR’s Isabella Keith drives the ball upfield during a game last year vs. Caesar Rodney. It was a cold, windy evening Tuesday, April 17, at Caesar Rodney High School — almost as cold as the Indian River High School girls’ soccer team’s offense the past two games. The Riders, who defeated the Indians twice last year — including in the Henlopen Conference championship game — continued their winning ways over IR with a 3-0 decision. Three different girls scored in the first half for the Riders, who out-shot the Indians 16-8 in the contest. CR goalie Morgan Desaulniers made some very impressive saves to preserve the shutout and squash any comeback attempt by the Indians in that second half. CR got the scoring going at the 23:49 mark in the first half, when Jada McCullough perfectly placed her long shot from the right wing by bending it over the outstretched arms of IR goalie Fabrea McCray. Almost five minutes later, Jessie Prillaman hammered home a follow-up shot to make it 2-0 Riders. Prillaman figured in on all three goals for CR, assisting on McCullough’s opener and helping on the third goal of the half by Macy Ramsey at 31:02. The string of bad-luck losses for the Indians actually started back in their season-opener, when they out-shot Polytech 14-1, only to have that one shot be the game-winner in overtime. Then a loss to Sanford last Saturday was due to an own-goal. “We play Sanford. We have a penalty kick that hits the cross bar, and then give up an own-goal to lose 1-0,” assessed Kilby. “You know the Polytech game — we out-shoot them 14-1, they get that one shot in overtime, we lose. We’re gonna be OK. They just have to keep their heads pointed in the right direction. They just have to keep playing. I can’t wait for them to get on the field on Thursday,” he said of the April 19 game scheduled at Lake Forest. Following Thursday’s game, the Indians will play four of their next five games at home, including next Tuesday, April 24, versus Cape Henlopen. Penalty kicks: CR had two penalty-kick opportunities, to just one for the Indians. McCray made nine saves on the night for IR. In their three losses, the Indians have given up a combined five goals. In their lone win, they scored six goals.